Schools and college campuses everywhere are using technology in the classroom at an increasingly rapid rate. Incorporating new technology into your school wireless network can provide many advantages particularly if it is used to create flex spaces. Flex spaces in educational facilities enrich the educational experience by providing students with the opportunity to work in more collaborative spaces, simulated real world environments, and distance learning classrooms. Using technology in the classroom schools and college campuses can take advantage of the many benefits flex spaces have to offer. Here are some examples of the types of flex spaces that can create to make education more relevant, engaging, and effective using technology in the classroom. 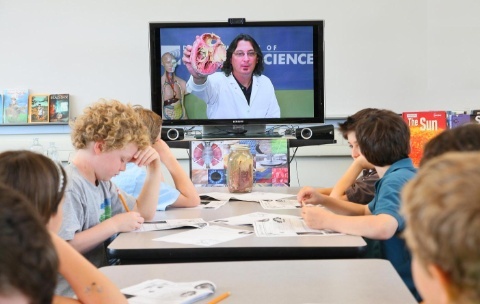 Collaboration rooms allow students to work in groups and share information with one another by giving them a connection to the same displays that the instructors use. The classroom technology in these rooms includes multiple video displays, a large video matrix switch, and a touchscreen control system. It is very important to plan out the desk locations within the room to determine the total number of work groups that will need to connect to the system. For example, the collaboration room could be used for an economics or stock trading class, where multiple financial channels need to be shown on the classroom displays just like the image below. 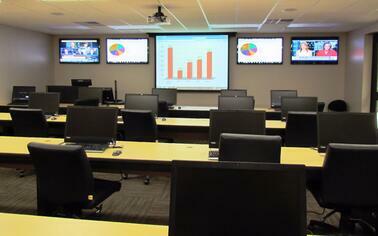 We designed and installed the equipment for this finance lab at a local private college. These flex spaces simulate real world experience. Your students have reviewed the material, and now it is time for them to apply what they have learned. 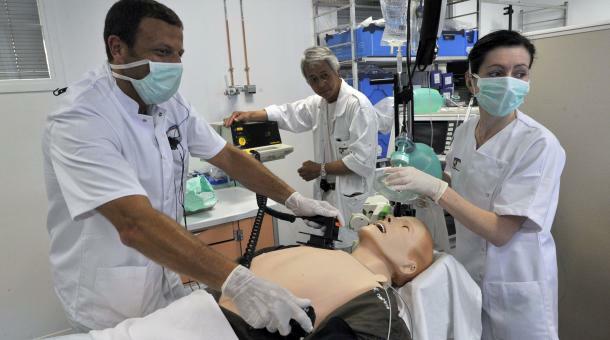 Training rooms, such as a replica of a doctor’s examination room, can be equipped with video and audio surveillance systems, to record the performance of a Physician’s Assistant student while completing a lab assignment. 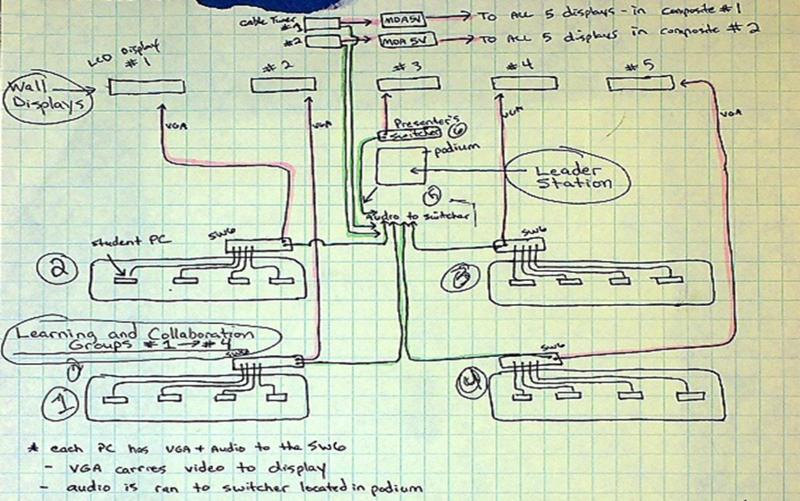 Review rooms provide an area for instructors and students to meet and review the recording of the lab assignment so they can work together to perfect their skills. These recordings can be archived for future student instruction. Distance learning classrooms create unlimited learning opportunities for your students by implementing a video conferencing system, into your school wireless network. This will allow students’ access to instructors and guest lecturers from around the globe. Distance learning classrooms can open up a whole new world of resources, courses, and experiences. 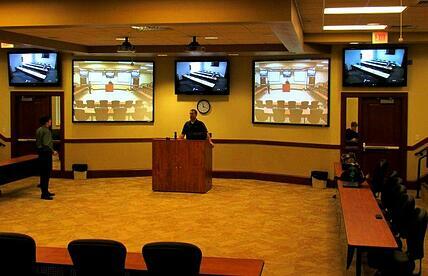 Below is an example of a distance learning classroom we recently finished. This flex space is used to teach students at a whole other campus. In this image, 3 smaller displays are the the student's view of the teacher and the 2 larger displays are the teacher's view of the class at the other campus. Using technology on your school wireless network to construct flex spaces such as those listed above is an excellent way to engage and better prepare your students for the future. Of course there are more types of flex spaces you can create with classroom technology; these are just a few examples to show you some of the great learning opportunities you can create for your students. Although the final product of a flex space is rewarding, preparing your school for flex classrooms can be an extensive process. There are many classroom technology and school wireless network infrastructure considerations to review to prepare your school for new learning tool implementation. That’s where we can help. SecurEdge Networks provides planning, deployment, and design for school wireless networks as well as installing the types of audio and video technology in the classroom you need to create flex spaces. Contact us here with any questions or for a Free Consultation! You can also download our free school wireless design guide below for more information. Our goal is to be a resource for you. Good luck!